In biblical times, a name was more than just a way to address someone. A name revealed important information about the individual's character. 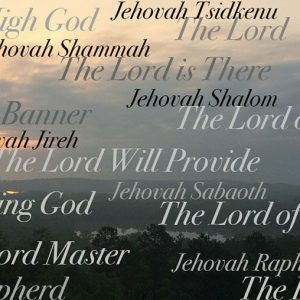 What then, can we learn about God by studying His names? Pastor Tony Evans talks about the various names of God and the powerful meaning behind them. Bob: There is great power in a family. It’s a power that pastor and author Tony Evans has experienced first-hand. Tony: I was born in a non-Christian family; but when I was 11, my father accepted Christ—his life was radically changed. When he came home with this new-found faith, he brought a fire into our house. He then led my mother to Christ. Then my mother and father took the four of us, as children, and put us around the kitchen table. He shared the gospel with us. I remember how I was like knocked over. I accepted Christ that day—which changed my whole trajectory—because my father, being impacted, affected me in that relational experience. Bob: This is FamilyLife Today for Monday, December 7th. Our host is the President of FamilyLife®, Dennis Rainey, and I’m Bob Lepine. Children often follow in their parents’ footsteps. Where are you leading your children spiritually? We’ll talk about that today with Dr. Tony Evans. Stay tuned. Dennis: Well, there’s a reason why you’re saying that. Dennis: You’ve heard our guest today preach. Bob: I’ve heard him preach. 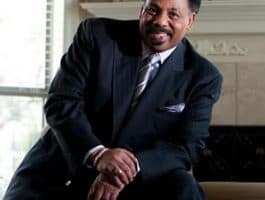 Dennis: Tony Evans joins us on FamilyLife Today. Tony, welcome to our neck of the woods up here. Tony: Well, I’m excited to be here. You know, this is my first time on your premises. It’s pretty exciting to see what God has done with you—your love for God, your love for the family, and how you are touching lives through this great ministry. So thanks for having me. Dennis: Well, we’re thrilled to have you. Tony and his wife Lois have been married for more than four decades. They have four children. Bob: Oh, here we go—I know where this is going; yes. Dennis: He is a graduate of THE Dallas Theological Seminary. Bob: A fellow classmate—you had a class together. Dennis: I was in class with Tony. He sat up front, where he belonged. I was in the back row, where I was just glad to be in class. Bob: Scholars in the front. Dennis: No doubt about that. Bob: Steerage in the back. Dennis: He has also authored a book called The Power of God’s Names. This is a big heartbeat for Barbara and me, here at FamilyLife, Tony. Why don’t you just share with our listeners why you wrote a book about the significance of God’s names? Tony: Well, first of all, when I began to discover the various names of God in Scripture and how tied they were to people’s lives, circumstances, problems and needs, then I began to make the correlation that God had a name for our circumstances in life. In fact, most of those names come out of situations that people were in. Then, I saw the significance of names in general—God would change people’s names / He changed Jacob to be Israel—because of the situation, the circumstance, or the message He wanted to communicate—then it becomes very obvious that God is into names. Unfortunately, today, we name names because we like them—not necessarily because they have significance—sometimes we do. But in God’s case, His name and the names He ascribes have significance, meaning, application and transformation. Because of all that was involved with that, it was just a great study and a great thing to teach. It became a great thing to write about to get to know God better. The bottom line is—God gives us insight into His character through the use of His names. Dennis: Yes, we get to know Him through His names. Dennis: And we find the importance of His name all the way back to the Ten Commandments. Dennis: Then, again, in The Lord’s Prayer when the Savior taught us how to pray. He said, “Hallowed be Thy name.” Unpack both of those—what it means in the Ten Commandments about not taking God’s name in vain and, then later on, in the Lord’s Prayer. Tony: Because God’s names are a reflection of His person and His character, He wants His name to be honored for the person who stands behind the name. When we talk about people in our culture, whether they’re the President, or whether they’re the mayor, or the governor, their name reflects their position. That position has a certain level of authority assigned to it. We don’t want people to call us out of our name, and God doesn’t want to be called out of His name. So to take the name of the Lord in vain—the word, vain, means “unto emptiness; without its meaning attached to it.” There is a Person behind the name—so don’t mess with the name because you don’t want to insult the Person. It has to do with the value of the Person. The word, hallow, in the Greek text means to “set apart as unique, special, one-of-a-kind, in a class by itself.” So you don’t treat God’s name as—certainly not profane—but neither do you treat it as common. Holy is His name. It’s sort of like in the kitchen—you’ve got the dishes in the sink. We’ll call those the “profane dishes” because they’re dirty. [Laughter] Then you’ve got the dishes in the cupboard—those are the regular dishes—breakfast, lunch and dinner. But then you’ve got these dishes that are in the dining room—they’ve got their own room, they’ve got their own glass cabinet, they’ve got their own specialized silverware. You better not touch those because those are for guests or special occasions and birthdays; you know?—because they have been sanctified as unique and are treated that way. God’s name is unlike any other name. It is to be held special, unique, and separate from that which is ordinary, common, or profane—which is really what the whole book of Leviticus is about—separating God and treating Him like He’s one-of-a-kind because He is. Dennis: And sometimes, when we think about God’s name and taking it in vain, we typically think about not using God’s name as some people do—as a curse word. Tony: Absolutely. But that’s like the extreme. To use it in vain, in just common ordinary, is to attach it to something that does not have the value that His Person has. Whenever you use His name in an empty way—it’s a throw-in word without the Person standing behind it being honored for who He is—then that means that you have used it in a way that’s illegitimate, as far as He is concerned. Bob: I was really fascinated by your observation that each of these descriptive names / these titles for God that we find in the Old Testament were born out of God identifying who He is in the circumstance that a person finds himself in. So that when God says, “I am the Provider,”—when we learn about Jehovah-jireh—it’s in the context of people recognizing they needed provision and God saying, “I take care of that for you”; right? Tony: Well, that’s the fascinating point about the names of God—is it’s not esoteric, ethereal, and unrelated to the realities of life. In fact, that’s how the Bible was written. It wasn’t written as one theological document, where you can go to one place and find everything you need on any given subject. It was written in what we call “Biblical Theology,” where God was involved in and engaged in the reality of people’s lives and, therefore, identified Himself in those realities. —those situations allow you to see the name of God break forth in the midst of your confusion. Bob: This was Genesis 22; right? Tony: Genesis 22 [verses 1-19]. Bob: And Abraham says, “God will provide.” He declared—Abraham’s the one who declares, “God is our provider”; isn’t he? Tony: Absolutely. It’s a very interesting theme that comes out of this. The word, provide, means to / technically, it means “to see beforehand.” So God’s pre-vision affects his provision. So when you see that connection—what God sees you do affects how He provides for you in light of that—and God makes a statement in that verse, where Jehovah-jireh is written / He says, “Now I know that you fear Me.” Now that’s a weird thing for God to say because He’s omniscient—He knows everything past, present, and future—so why do You know it now? The answer to that is—God likes to experience everything He knows. You see, God knows everything; but God hasn’t experienced everything He knows. For example, God knows sin; but He’s never experienced doing it. So God wants to enter into our experience of choosing Him. When He sees we choose Him, we see how much He can provide. Dennis: Speaking of experience, I really like what you point out in your book about how the Book—that is the Bible—begins in Genesis with God introducing Himself with a very special name. Tony: Elohim—“In the beginning, Elohim created the heavens and the earth.” Elohim—we call it a majestic plural—it speaks of the grandeur of the power of God. So, when God created, He created ex nihilo; that is, “out of nothing.” God, simply by the spoken word, creates the raw material out of which He does His own creating. That means you don’t have to see how God’s going to fix something in your life because He can create something out of nothing. He can take barren wombs and create babies. I mean, God is spectacular! When you understand that, it changes your view of God / your scope of God. Now, hallowing His name becomes a lot easier because He doesn’t need anything you see for Him to work with to fix what you need. Dennis: I quote [A.W.] Tozer all the time on this broadcast, and it’s what your book is about. Tozer said this, “The most important thing about you is what you think about God.” What you’ve helped us do here—by going through each of these names and unpacking what they mean—is thinking rightly about who God is—Elohim the Creator, the Restorer / the One who rested on the seventh day. It introduces us to, not merely the character of God, but how He relates to us, as broken human beings today. Tony: And that’s what makes it so exciting because eternity is fundamentally the uninterrupted knowledge of God. Right now, in our temporal existence, we have the interrupted knowledge of God—it’s interrupted by circumstances, problems, sleep, work—it’s interrupted by a lot of things. Eternity is when God will remove all interruptions. There will be so much to learn about God—He’s not even going to let you have nighttime. He’s going to give you a body that can’t even sleep because this is going to be in perpetuity—it’s going to be, forever, God unveiling and exposing Himself and living on the high of that uninterrupted knowledge. The names of God give us clues to what we will see on a much grander scale later. Dennis: Everybody remembers that great scene, where Charlton Heston [portraying Moses] stood before the burning bush. God spoke to Him, and the name of God in that situation with Moses was? Tony: “I AM THAT I AM.” That’s where God identifies Himself as the self-sufficient, independent One who can address all of your needs. In this contradiction—you know, a burning bush is a contradiction—a bush that’s staying green?—that doesn’t make sense. That’s often how God reveals Himself—in the contradictions. So Moses wants to know, “Who are You?” He says, “I AM THAT I AM.” In other words: “I am defined by Me. I’m not who you want Me to be; I am who I’m declaring Myself to be.” That’s when you have to sit down, look, and listen, and let God define Himself to you and not make Him into the image you want Him to be because that’s called idolatry. Bob: This is the covenant name of God that’s offered here in Exodus 3 [verse 14]—the “I AM THAT I AM.” We get Yahweh or Jehovah from this declaration; right? verse 4—but we’re not introduced to it until He creates man—because this covenant name is a relational component of God. So, when He meets Moses and is getting ready to give Moses a direction for leading His people out, He wants him to know: “I am the power / God is going to pull this off, but you better stay close to Me in relationship so that My power can be experienced by you.” That’s why you don’t just want to know Elohim God—you want to know Jehovah Elohim because you want the relationship with the God who has all the power. Bob: Our listeners, who would be reading their Bibles today, anytime they see the word, LORD, capitalized in their Old Testament, that’s that Jehovah name. Tony: That is Jehovah—L-O-R-D. When people see the name—LORD or God—they think it’s the same word; and it’s not the same word, typically. Dennis: Okay; let’s talk about how Tony Evans met the relational God, at that point. Let’s move this from a name that we’re learning here to an encounter with the living God in your life. How’d that happen? Tony: Well, it happened when I was 11 years old. I was born in a non-Christian family; but when I was 11, my father accepted Christ—his life was radically changed. When he came home with this new-found faith, he brought a fire into our house. He then led my mother to Christ. Then my mother and father took the four of us, as children, and put us around the kitchen table; and he shared the gospel with us. I remember how I was like knocked over—one, to hear the gospel—but to see what was happening in my dad’s life because I saw that relational transformation in him and I wanted that. So I accepted Christ that day—which changed my whole trajectory and the trajectory of my family in the inner-city of Baltimore, Maryland, growing up. We weren’t like any other family in our neighborhood because my father’s life had been so transformed. That’s why I know fathers are so important to reflect the character of God because my father, being impacted, affected me in that relational experience. Dennis: How did his life change? You said it three times in that paragraph you just gave us. Tony: It changed because he was going to divorce my mother. He said: “No, I’m going to stay here. I’m going to become a man of God and see if that changes my wife / [Tony’s] mother.” And it did. So his love for God—it changed him / changed her. Tony: And that’s how he wound up leading my mother to Christ. Dennis: And here you are—a little boy. Dennis: You’re radar unit is locked on your dad; and you’re watching your family blow up, basically. Dennis: —“I AM THAT I AM” invaded your family. Tony: He invaded / He took over. It became something other than I’d known up until that point. That created in me a hunger for the Word and a hunger to—I used to go out on the street corners with my father, handing out tracks / I’d go to the prisons with him, and watch him preach—I’d support him. One time, I got on the car and gave a little gospel message. All of that was preparation for what God is allowing me to do today. Coming to know Him is a decision to place your faith in the finished work of Jesus Christ. He died on the cross for your sins, in your place, in order to establish that relationship; but He can’t do that unless the issue of sin is addressed—so He died to address that issue. When you come to Him and say: “Well, Jesus, I’m a sinner, and I need a Savior, and I choose to trust You as my personal Substitute, and I invite You to enter into my life to change me and to make me the person You want me to be in a relationship with the living God,” He has to respond to faith in Him. When He does, that makes you justified; or God legally declares you in relationship with Him. Then, as you submit to His rule in your life—it’s called discipleship—as you let Him call the shots in your life, the more He calls the shots, the greater the relationship will grow. Dennis: —and the more transformation occurs. Tony: The transformation is the result of the relationship. Dennis: Yes, some people feel like they have to clean their life up before they come to Christ. They get it backwards. Dennis: When you invite the King in, He’s going to clean it up. Tony: And boy; does He have a cleaning service! Sheesh! Dennis: I’ve got a question for you. I like to ask guests, just to hear their answer. The question is this: “What is the most courageous thing you have ever done in all your life?” And the definition of courage is not the absence of fear / it’s doing your duty in the face of fear. Tony: That’s a fairly easy one to answer. I was in college, and it was during the Civil Rights Movement. I would go out on Friday nights and preach on the street corners at bus stops in Atlanta. There was a particular man who said, “If you don’t stop preaching, you will never be able to preach again.” He reached into his pocket. At that point, I faced a crisis moment because I knew he could have had a gun; and he had just told me to stop. I remember whispering to the Lord, “Lord if this is it—and I don’t know if it is or not—but if this is it, unto You I commit my spirit,” and I kept preaching. After a while—when he saw that I was not going to stop—he took his hand out of his pocket, and he walked away. But I remember the feeling of that moment. Since that moment, I have not hesitated to keep going in the face of trouble because I got security from God, in some unique way in that moment, so no matter what situation I’m in now—as long as I’m convinced God wants me there and I’m standing on His Word—when I stand up, I’m pretty fearless. —is getting a copy of Tony’s book, and studying the names of God, and becoming more acquainted with Him because, once you know Him, He will make you courageous—I promise you that. Tony: He’s good at that. Bob: It is a rich study to dig into the names of God. We’ve got copies of Tony’s book in our FamilyLife Today Resource Center—called The Power of God’s Names. Go to FamilyLifeToday.com for information on how to order a copy of the book. Or call us at 1-800-FL-TODAY. Of course, many of our listeners are familiar with the fact that your wife, Dennis, is working on ornaments—Christmas tree ornaments—that display the names of Jesus. This year’s ornaments have Jesus’ name in different languages. You see the name of Jesus displayed in Spanish, one in Russian, one in Hebrew, one in Arabic and one in Mandarin. We’ve had a lot of people who’ve been ordering these ornaments to place on their Christmas tree this year. We’ve also created a resource designed for children to help them understand the names of Jesus. This is called “The Twelve Names of Christmas™: Who Jesus Is to Me”—a dozen ornaments for kids. This is designed for preschool- and elementary-age children. A dozen ornaments—one that Jesus is the Living Water, the Lamb of God, the Bread of Life, the Bright Morning Star, the Good Shepherd. Along with the ornaments, there is a storybook so you can read the stories to the kids as you hang these ornaments on your Christmas tree. Dennis: You know, what Tony has reminded us today, Bob, is the truth about God. That’s why FamilyLife Today exists—to remind people about the truth about God and who He is—but also the truth about how He wants us to live our lives and our marriages and families. Your radio program helped me: Year one, when I gave my life to Christ, and my husband was an unbeliever, and we had a newborn baby. Year two, when my husband had an affair, it helped me choose reconciliation instead of divorce. And it was there again when my husband surrendered his life to Christ. It was there in year three, when health issues became worse; and then in year four, when we faced possible foreclosure on our home. “My point is this—I want you to know I play your radio broadcast on my tiny FM radio in my kitchen. And I strain my ears to hear every word through the screams of kids, barking dogs, and the rumble of clothes being tossed in the dryer. It has been my lighthouse—FamilyLife Today—my tiny light leading the way / my hope that I can finish the day. Bob, that’s why we exist—to give people help and hope that they can finish the day. When people give to FamilyLife Today, they are standing with us to make this kind of ministry possible. Bob: Well, of course, right now, when you make a donation to FamilyLife Today—this is a critical time for you to do it, at yearend—each donation that is given during the month of December is going to be matched on a two-to-one match. We’ve got some friends of the ministry who have agreed that, if you make a donation of say $100, they will match it with an additional $200. That means the total value to FamilyLife is $300. They’ll do that up to a total of $2 million. We are hoping to take full advantage of this matching-gift opportunity. To do that, we need to hear from you. Go to FamilyLifeToday.com—make a donation online—or call 1-800-FL-TODAY—make your donation over the phone. Or you can mail your donation to FamilyLife Today at PO Box 7111, Little Rock, AR; and our zip code is 72223. We hope you can join us back again tomorrow when we’re going to explore more about The Power of God’s Names with our guest, Dr. Tony Evans. Hope you can be here for that. I want to thank our engineer today, Keith Lynch, along with the entire broadcast production team. On behalf of our host, Dennis Rainey, I'm Bob Lepine. We will see you back next time for another edition of FamilyLife Today.